A three-day meeting of the FORESDA consortium, which was organized at the beginning of November in Belgrade, the Serbian capital, put the accent on the innovation topics linked to SMEs. 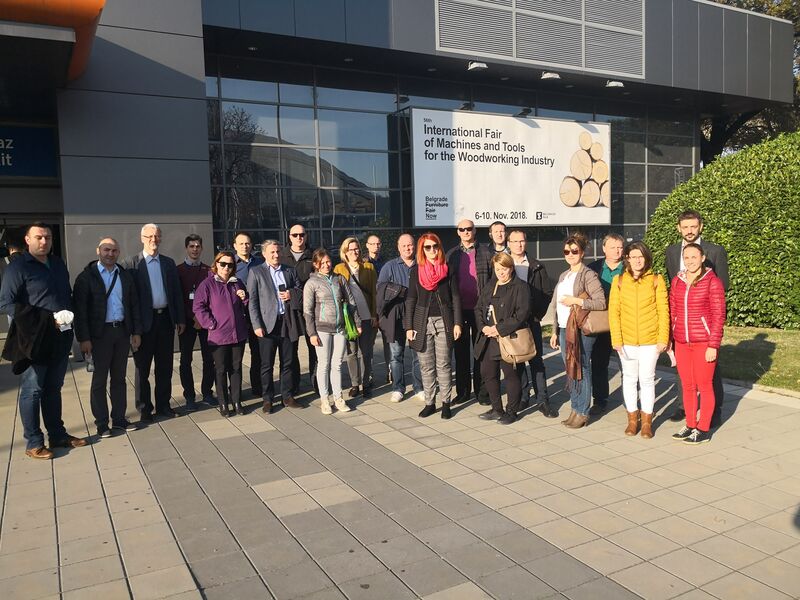 It was also an opportunity to check the first results of the pilot project* linked to the concept of oscillatory drying, the improved method of conventional timber drying, but also to visit a Belgrade Furniture Fair, which in the recent years became one of the most important furniture fairs in the Southeast European Region. Among project keywords, innovation definitely takes one of the two central positions (the other is cross-sectoral), and the added value of the project is the objective to establish the functional collaboration networks. The questions that naturally arise are: Why? And how? Then, is it not enough to have technology/knowledge transfer offices, professional associations, clusters, research institutions, and other similar facilities, or even departments within the companies that deal with the R&D&I activities? Why do we actually need the collaboration networks and what do they actually represent? The main reason for the implementation of this activity is the fact that companies deal with many obstacles in the process of developing some innovation. The biggest obstacles to overcome in the process of implementing more innovations within FBI are linked to the lack of direct state funding programmes (33%), lack of internal financial means (25%), and lack of experts and skilled workforce (25%)**. Therefore, the objective of this project activity is to generate and validate cross-sectoral, transnational innovation activities in the selected strategic innovation areas of the FORESDA project: (1) Smart and sustainable construction and furniture, (2) Innovative bio-based products and materials – non-conventional uses of wood-based materials, and (3) Energy efficiency. The selected tool to realize this goal is to establish the collaboration networks as international, cross-sectoral networks of SMEs, large companies and research organisations, which will develop joint innovation agendas. Those networks will act as idea generation engines for new products, processes, services on the mid-term and contribute to foster cross-sectoral, transnational innovation in the project countries and beyond. But the most important fact is that SMEs involved in the innovation activities will be provided with methodological and scientific knowledge in order to foster innovation, cross-sectoral and transnational thinking. In this way SMEs will get a concrete support and will be sensitized for the further thinking and developing of innovations in the direction towards circular economy and sustainable business models, and this is how FORESDA directly contributes to the complaint that is often heard from the companies' side: Projects are good, but we have enough surveys and strategies. We need some real support! Oscillatory Drying - A Future of Drying? The Belgrade meeting was hosted by the IPA partners from Faculty of Forestry (University of Belgrade). It also provided the opportunity to interact with the students and to learn about their projects, especially in the field of furniture design. In addition, the project partners visited the pilot project implemented by the Serbian colleagues, which deals with the oscillatory drying of wood. The objective is to improve the conventional drying method. Until now, more than five new oscillatory drying cycles are conducted – Most of it on beech timber 38 mm thick. Almost all oscillatory schedules gave better results in term of drying quality and/or duration as compared to the conventional drying schedule. Drying tests on oak timber 25 mm thick were started. First oscillation run was shorter for approx. 20 percent than conventional one with a very similar drying quality! Belgrade Furniture Fair - The Region is not Lagging Behind! The project meeting was organized parallel with the Belgrade Furniture Fair. The 55th edition showed that the region is not lagging behind. Two pavilions were dedicated strictly to the design and the main event, Design Talks, gathered some prominent designers and architects. The common conclusion tackles the biggest challenges linked to the young designers: They all need a big support in all phases of their work, but they also need to be realistic and understand that not every company is designed for their design! In addition, the most producers from the Southeast European Region cannot be competitive in terms of the production capacity or price but can be in terms of having a great potential of the project ideas, which were also presented during the fair. *The cross-sectoral approach, which is one of FORESDA's main accents, is being more and more important for further development of the economy in the Danube Region. Accordingly, FORESDA develops ten pilot projects linked to three thematic areas: Smart and sustainable construction and furniture, innovative bio-based products and materials, and energy efficiency. The pilots should lead to the emergence of new cross-sectoral value chains and increased effectiveness of collaborative research and innovation activities. The implementation phase started in January 2018 and some interesting results have already been achieved. More information about the pilots are available on request to projekti@drvniklaster.hr. **The data was collected in 2017, during the survey conducted within each of the project region among wood processing companies and other relevant market stakeholdrs. Upon those data as well as other regional analysis, FORESDA Project Consortium developed a Transnational Strategy on Cross-sectoral Level, which addresses the identified needs for further development and an increase of R&D&I activities with respect to the regional innovation systems, aiming to improve the framework conditions for forest-based cross-sectoral value chains. Check more information about FORESDA and forest-based industries in the FORESDA Project Video.